ADOPT YOUR MP or MPP! Let's face it. Without your vote, your MP is powerless. Voting once every four years however, just isn't going to cut it. By going directly to your MP, you can esnure your angelic voice is hear year-round. And get this, you have an advantage that the majority of your riding does not have: your age. MPs love politically active young people more than they love money and fame. Well...maybe not that much. Despite the intimidation factor of sitting before that one person in your neighbourhood who chums around with the Prime Minister, if you follow these easy steps, you won't JUST be chumming around with the Prime Minister, you will be influencing him. Nobody likes the "r" word, esepcially when we've spent the majority of our life in school. Think of it this way, most people don't want to go on first dates without looking up their mystery person on Facebook, asking every question they can think of to a mutual friend, or checking out their Twitter feed. Although you more than likely won't be dating your MP, you are trying to woo him/her and become their trusted confidant. Thankfully, Campaign Life Coalition is rich with resources you can use to make researching MPs easy. All it takes is a few clicks of the mouse to find out the information you need to help you sound like the intelligent and considerate constituent you are. To research your politician, click here. Be sure to read his/her CLC rating, voting record, quotes and questionnaire to get a well-rounded viewpoint as to where they stand on key issues. Make sure you take note of the positive and the negative votes so you can use them to your advantage. c) dress appropriately. Look professional. Before you are even able to get a word in, your MP will be sizing you up based on your physical appearance and body language. Be confidant in everything you are saying and hold your head high. a) Use your age as an advantage. Slip in how old you are in your phone call and you are more likely to get an appointment right away. c) Confirm with an e-mail a few days before your meeting to ensure that the meeting is still taking place, as well as show you are organized as well as eager. The single most important thing you can do during your meeting is to build trust and a rapport with your MP. If you give the right impression, come across as knowledgeable, reasonable and passionate, then your MP is more likely to take your request to heart. At the end of the day, being right about something is only part of the whole package of selling your point of view to your MP, and motivating them to do something. a) Come in prepared to have a conversation. This is not a lecture, or a chance to ear-bash your MP with your views. With this attitude, your whole demeanor will help build trust and a rapport through your body language, voice and facial expressions. b) Ask meaningful, open-ended questions. For example, "what is your personal stance on the abortion issue?" or "do you have an background interest in this issue?". After finding out what your MP's personal stance is, ask your MP if they would be willing to put forward legislation that either follows their personal conscience on this issue, or that you, as a constituent would like to see as a means of keeping women and unborn children safe. c) Be fair, and listen to their reasons for opposing, supporting, or being reluctant to take a stance on your issue. You are more likely to convince your MP to change his mind if you can gently show them why their opposition or reluctance is misplaced and the benefits of supporting you outweigh these. Coming in with a rehearsed, static script will prevent you from having the dynamic conversation you need to tailor your conversation to your MPs needs. (ie: I understand why you feel this is a divisive issue, however polls consistently show that the majority of Canadians do not support the status quo on the lack of abortion legislation in our country). Having a conversation with your MP at their level will make it easier for them to change their mind on an issue, because you can show them that they're not really changing their minds at all! It's better to assure them that your position is more consistent with their beliefs, than to ask them to change their beliefs. For example, "I admire your dedication to human rights, which is why I think that this type of legislation would be in-line with that mandate since it ensures human rights for all Canadians". e) Have fun and relax. Think of this like any other conversation you have had about an important issue. MPs have to deal with a lot of people all the time. Mostly people who call their office non-stop or are overly emotional. That's why your MP is more likely to like and respect you for coming in and having a relaxed conversation about an issue you care about than something dry, rehearsed and over-the-top. In your research, find out something unrelated to the issue at hand (for example, a picture of your MP water-skiing, or at a bake-off), and start of the conversation about something light-hearted. This not only shows that you are normal and likable, it also shows you follow your MPs actions and are knowledgeable about your riding. f) Leave like a pro. Don't get shuffled out before getting what you came for. Try to get a clear commitment of help from your MP. Don't settle for vague promises. Leave with something open-ended to ensure future visits and communication. For example, "I look forward to meeting with you again". Last but not least, if your MP asked for any further information, make sure to drop it off at their office as soon as possible. This shows your commitment to the cause. After your meeting, be sure to follow-up with your MP. For example, if you visited them asking them to vote in favour of a particular motion or bill, be sure to write a letter to your MP or make a follow-up visit depending on how they voted. This communicates to them that they will always be accountable for their actions, whether they were positive or negative. After your initial visit, be sure to thank them for seeing you, whether it be through an e-mail, tweet or phone call. That keeps the communication lines open and the relationship amicable. Lastly, don't forget to e-mail or call Campaign Life Coalition after your initial visit so we can add more information to our file on each particular MP. This information will help CLC alert Canadians during the next federal election of who the supportable pro-life MPs are. 1. Contact us at [email protected] with your postal code and we will connect you with your nearest pro-life MP's office. Any free time you have to volunteer will make a huge difference in political campaigns across the country when these elections take place. Not only that, but it's important to develop personal relationships and trust with your elected officials so that when the time comes, you can positively influence them when it comes to important issues such as abortion and human rights. Don't let this golden opportunity go to waste. Volunteering is easy, effective and it's a great way to be part of a team that is one step closer to making our country a better place. 2. Join a political party. It's simple. Just go online an take out a membership to a political party of your choice. Research the one that will be most inclined to run pro-life candidates or vote pro-life. As a member, you will be able to vote in leadership races, join the EDA (electoral district association) in your riding, and vote in nominations. This is a very important aspect to electing a pro-life Member of Parliament, so go online and join today! It's inexpensive (usually about $15 a year) but the results are invaluable. 3. Vote pro-life. Voting is the most important way to send a loud and clear message that young Canadians do not want a culture of abortion. 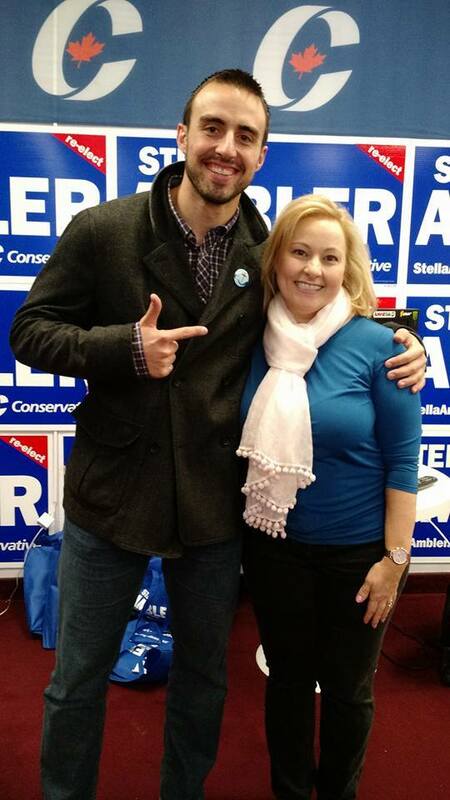 The best way to make your voice heard is by casting a ballot for the pro-life MP in your riding. Without the right to life, all other rights are meaningless. Make this your make-or-break issue. The time is now to elect more pro-life MP's than ever before so we can finally enact pro-life legislation and saving lives in the process. 4. Join us in spreading election awareness. This is one of the most important elections of our lifetime. For the first time ever, pro-life Canadians have been blatantly discriminated against by both the Liberal and NDP from running in their parties purely because they are anti-abortion. We cannot allow these elected officials to trample on our rights. We must stand up and publicly decry these leaders and their undemocratic policies. We also must also embark in positive messaging to shed light on those MP's who stand up for human rights and are willing to bring forward and vote in favour of pro-life legislation. Follow us on Facebook and Twitter so that you can share articles, videos, memes and more to educate Canadians about these important issues.